« Purim Same’ach! Happy Purim! Arab media reports Ayatollah Khamenei brought for urgent care in Tehran after several of his body systems fail. Just in time for Purim, the Jewish holiday celebrating the redemption of the Jewish people from plots of genocide in ancient Persia, Iranian Supreme Leader Ayatollah Ali Khamenei was reportedly hospitalized incritical condition on Wednesday. 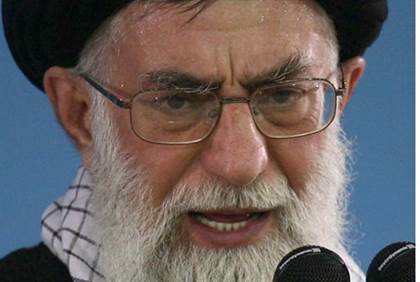 According to Arab media reports cited by Israel Hayom, Khamenei was urgently brought to a hospital in Tehran after several of his bodily systems had already failed. The reports add that the 76-year-old supreme leader of the Islamic regime has undergone surgery and remains in critical condition. Recently it has been reported that he was suffering from prostate cancerwhich had spread to additional parts of his body, and due to his poorhealth condition he had largely ceased taking part in public events. The hospitalization comes just days after Prime Minister Binyamin Netanyahu addressed Congress on Tuesday to warn of the existential threat to Israel and the world that Iran poses, urging America to avoid the deal being formed on Iran’s nuclear deal ahead of a March 31 deadline for talks. Khamenei has demanded Iran be allowed to increase to 190,000 centrifuges in the deal being formulated, an amount that would allow it to produce a nuclear arsenal within weeks. And yet it was revealed last November that US President Barack Obama had sent secret letters to Khamenei in an overture looking for an alliance and cooperation in the fight against Islamic State (ISIS) terrorists in Iraq and Syria. Iran is the largest state sponsor of terrorism, and as Netanyahu noted in his speech, has seized influence in Yemen through the Houthis, Lebanon through Hezbollah, Iraq by taking a lead role in the ISIS fight, and Syria by propping up President Bashar al-Assad militarily. This entry was posted on March 5, 2015 at 2:53 PM and is filed under Foreign policy, Iran, Iran scam, Iranian nukes, Israel, Khamenei, P5+1. You can subscribe via RSS 2.0 feed to this post's comments. Every once in a while, our Creator gives us, the faithful, a little reassurance. Ironically, only the faithful will know it for what it is. Still don’t see other news outlets carrying this story. The Times of Israel released an article but it says it got if from Israel Hayom as well. More are starting to emerge, i.e. Le Figaro citing intelligence sources. Still waiting on reports here in the US. Tell him Netanyahu and the Israeli people will be sending him there best.